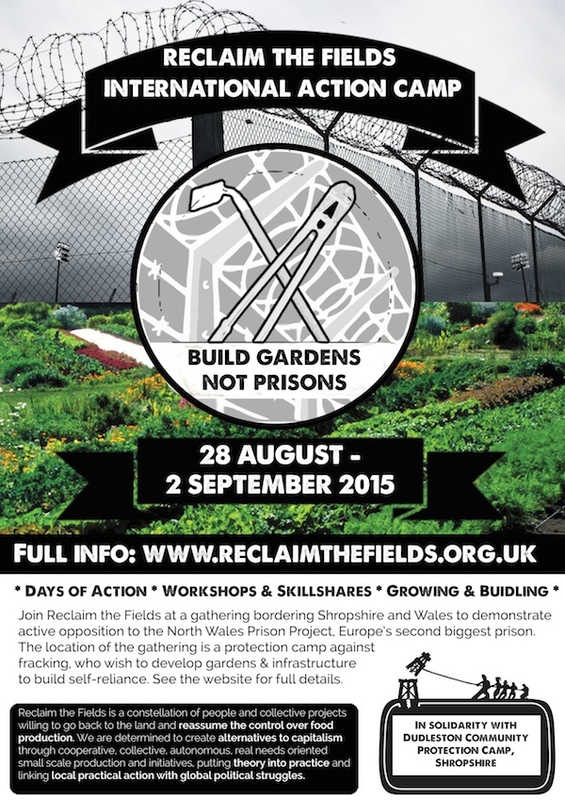 Reclaim the Fields aims to have regular gatherings, these gatherings are hosted by supportive projects, radical farms, on occupied community gardens, or on reclaimed fields around the country. 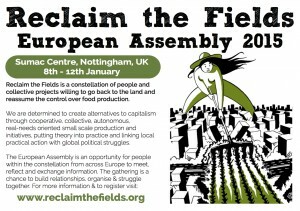 Anyone in RTF’s fledging UK movement can hold an RTF gathering, they are proposed and developed via the constellations mailing list – if you wish to hold a RTF gathering at your radical land project, going along and getting involved in the organisation of a Gathering would be a good place to start. Hopefully we’ll have increasingly regular gatherings – hosted by an ever expanding list of radical land projects, springing up all across the country! A growing grass-roots farm in the Forest of Dean, interested in developing resilient agro-ecological systems, that are both productive and ecologically regenerative. 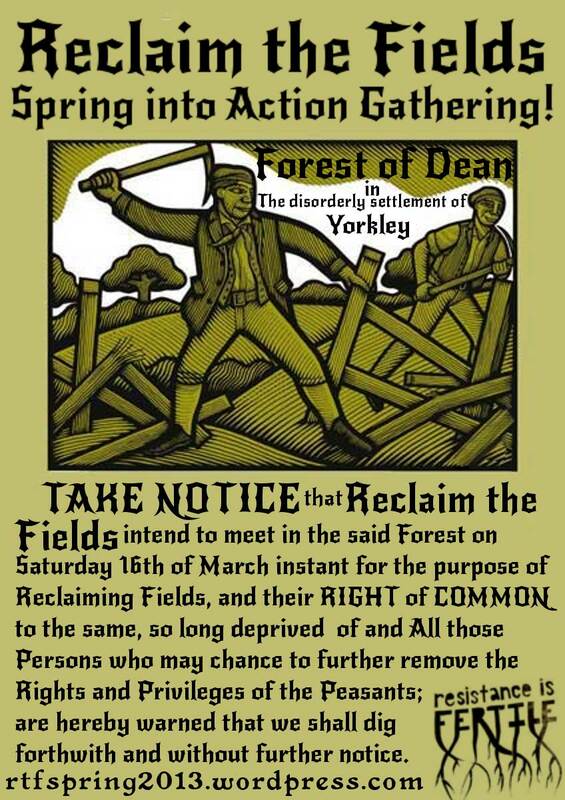 The Farm is hosting the Reclaim the Fields ‘Spring into Action’ gathering, on Saturday the 16th of March til Monday the 25th! The Gathering aims to be a platform for sharing practical land-based skills, crafts and related knowledge. We intent to ‘get on with it’ whilst continually seeking to create a popular discourse/ debate on the issues of land access, the right to food autonomy/ sovereignty and the right to build and dwell within a low-impact home on the land. The Seed Camp will start on the 8th of March, with a two day Permaculture course by Tomas Remiarz. The rest of the week will focus on setting up infrastructure and openly, inclusively organising the Gathering. Anyone interested and able to help get the Gathering off to a great start, should come along for this week, prior to the main Gathering! Lots of skill-sharing and fun will be had! We are currently looking for people interested in doing talks, running workshops and skill-sharing during the main Gathering… everyone will have the opportunity to share their skills and knowledge at the gathering, but we can publicise the workshops/talks offered before the gathering! So let us know what you’d like to offer or to see, in the way of workshops/skillshares asap! 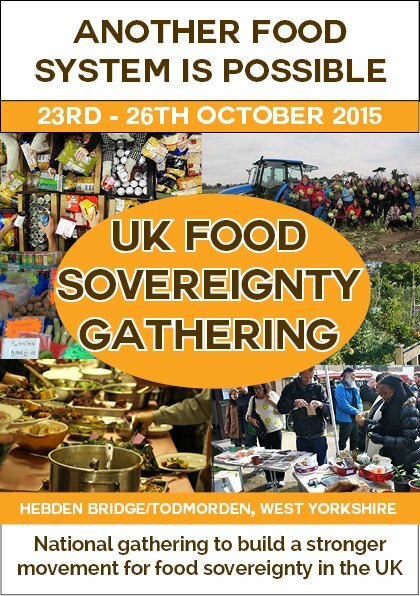 The weekends of the Gathering will be focused on talks, presentations, workshops and discussions. The week days between will be more focused on practical activities. yorkleycourt.wordpress.com < our main, local community facing website! rtfspring2013.wordpress.com < the gatherings own website! programme still under-construction! The Forest of Dean is a land betwix two rivers, a secret Wilderness in West Gloucestershire, right on the Welsh boarder. The Forest of Dean has historically been the home of many radical land-rights struggles and was settled by ‘the cabiners’, people who built their homes “by right” instead of through state dependence. They were treated by the state with the same distain as ‘squatters’ are today, albeit with more direct violence and less PR spin.